Nnedi Okorafor presents the second book in the Akata Witch series. Eventually, Sunny knows she must confront her destiny. With the support of her Leopard Society friends, Orlu, Chichi, and Sasha, and of her spirit face, Anyanwu, she will travel through worlds both visible and invisible to the mysterious town of Osisi, where she will fight a climactic battle to save humanity. Much-honored Nnedi Okorafor, winner of the Hugo, Nebula, and World Fantasy awards, merges today's Nigeria with a unique world she creates. 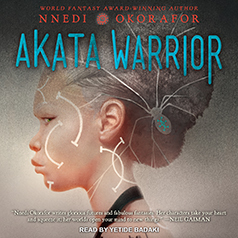 Akata Warrior blends mythology, fantasy, history, and magic into a compelling tale that will keep listeners spellbound.